Are you daunted by the prospect of writing your family’s whole history? We were! We read books that told us the project would take a year. We heard experts advise that we not proceed without an editor or designer. Who has the time or money?! And yet… at so many holidays and celebrations we’d gather with our families, and the stories would just start flowing! The older generation would start sharing their memories of times gone by, the younger generation would push for more with their questions, and the designated family genealogists would chime in with additional details or corrections. Over time there were some stories we’d constantly retell, and others for which only an unexpected association would trigger a recollection. We’d all laugh together over the funny anecdotes, mourn the tragedies that befell us, marvel at the new information we’d never heard before -- and part with hearts a little bit fuller from knowing more about our family’s history. Everyone’s a natural storyteller. It’s part of a being human. Writing guides, editors, and designers will make the stories better, but you already have it in you. We all know important family stories. It’s the inevitable result of being part of a family. Research will get you more and richer stories, but you already have stories worth sharing now. 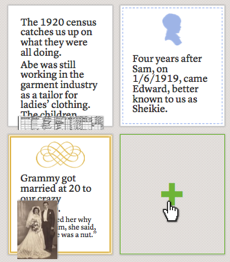 Treelines is more than storytelling software—it’s a whole new approach to writing and sharing your family’s history. Whether your end goal is to share one small story or document a complete family history, we at Treelines believe that stories are best told the way families naturally tell them when they get together: one story at a time, with repeated retellings adding detail and richness. Write one story, then another, then another… return to stories you had previously set aside to add more detail… and before you know it, the stories will weave together into the rich fabric of your family’s history. But you have to start somewhere and you have to start some time. So, let’s get started right now! What is your overall family story-telling goal? To make sense of your family history? Write a memoir? 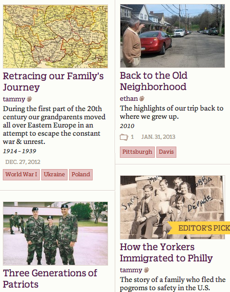 Share your stories in the genealogical community? Document the past and contribute to social history? Keep this goal in mind throughout the rest of the steps so that you produce a story that helps advance your goal! Most of this step is offline, but if you’re feeling stuck for ideas, read some of the public stories on Treelines for inspiration! Pick a story to start telling. What story is on your mind now? Or just start writing and see where things go! Grab events from your tree or start from a template (coming soon!). Who is in this family story? Link stories to your tree or build a tree as you write. What happens? And what happens next? And next? Start writing whatever moves your story forward—you don't have to use it all! Write, edit, sort, and design pages. How can you enrich your family story? Write what you see in them! No picture? Use your imagination and paint a verbal picture of your family member or of the story's setting. Include the social history of the story as important context. 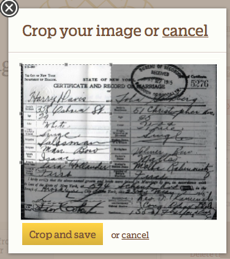 Upload pictures and records to accompany story pages. What is the source of your family story? Who told you? What records did you consult? Show the documentation, if you have it. 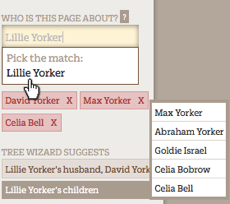 Add sources (if they weren't automatically pulled from your family tree). 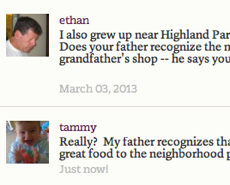 Even if you think your story isn’t done, your family can add new information and perspectives. Consider their reactions. Did you hit your goal? Nothing's ever final on Treelines! Incorporate feedback to make your story better. Or move on to another story and return to this one after you’ve learned more. Share your story, whether publicly with the community or privately with your family. Continue to improve it as you uncover more about your past! Bookmark this page and come back to it—or download this page as a PDF. It’s your guide to telling each new story. And start reading Treelines regularly. Our family storytelling experts will share advice regularly not only on each one of these steps, but also on the overall process of selecting and weaving stories together into a larger narrative. Writing your family’s history is a big job, but with every story you record using Treelines, you’re a bit further down the road! Congratulations on getting started!